Beautiful card from Pooja,Sonia.Congrats with your goodies. Such fun goodies! Can't wait to see your amazing projects with them! 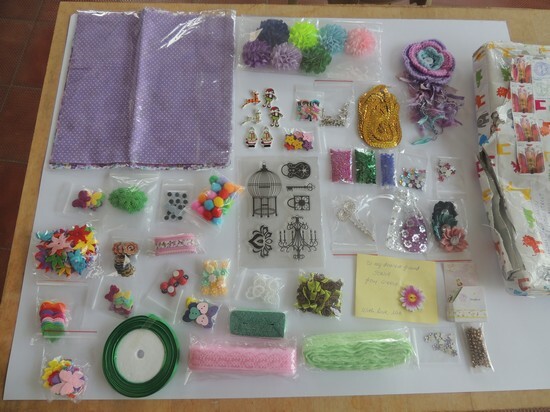 A beautiful post Sonia..the crafting world is surely a wonderful place to be part of..I hope your next year will be a happy one and full of crafting too.. This is such a happy andupbeat post. I love the prizes you have won and the lovely gifts aswell.The card with the upbeat sentiment isso perfect fora"down moment". Very true we are really blessed to have generous,supporting craftypals ! Wow what wonderful goodies you've received Sonia. I love the card at the bottom of the post, it is certain to put a smile on anyone's face when they are feeling down. Thank you so much for dropping by Sue...I have missed my blogging pals! A beautiful Ray of sunshine pooja card is ever so beautiful. You have received some beautiful gifts Sonia, I hope your life has settled down now and you are able to enjoy more of the things that you love. Awww... Look at all those amazing gifts! Crafty Friends are the BEST! I totally agree with you! And it's always so nice to receive HAPPY Mail - They always put a smile on my face when I get something sweet from someone! Big Hugs to you Sonia! All friends to be treasured for their generosity that brings happiness. 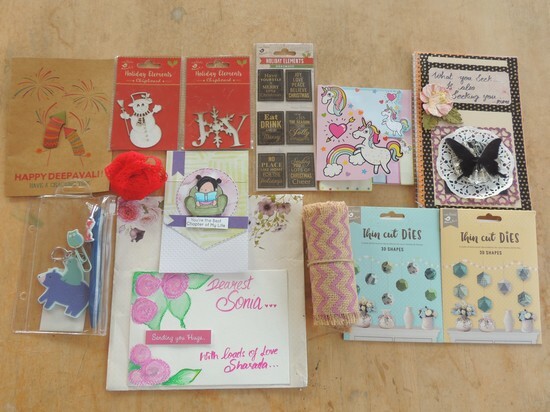 Oh Big WOW for all the wonderful goodies you received from such crafty bloggers. (I do know and admire Lisa's cards so much. Don't know the other bloggers, but they certainly shared some sunshine with you.) I'm so thankful for you that all this special sweetness arrived at just the right time to lift your spirits. And I'm awestruck the numbers of your followers (not at all surprised however!) That is certainly a momentous milestone, and one to be so proud of. I hope the remainder of the year is better for you, so that you can be happy crafting. We all have times when we have to put other priorities ahead of crafting and blogging, so that's totally understandable. You take care, big hugs. Enjoy all those wonderful gifts and thanks for sharing what marvelous folks crafters all over the world are. Blogfriends are wonderful friends also in real life... So glad for you, such wonderful toughs you received! Not only fabulous items, but also great signs of friendship! P.S. You asked for the fur on the hat of my teddy bear: I used an item named Fluffy Stuff, brand is Woodware. Simply put it on the zone you want cover and then use the embosser heat gun to make it puff. 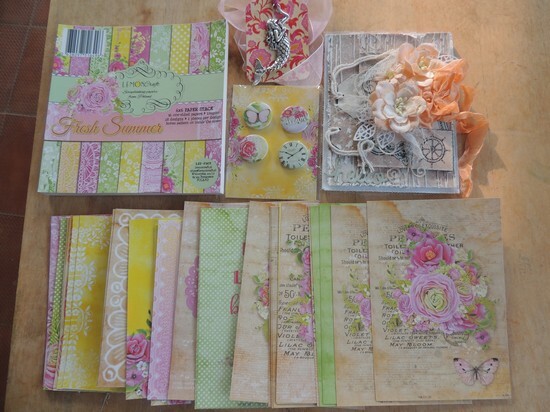 I loved reading your post, there are certainly many lovely crafty bloggers out there. Enjoy all your new crafty goodies. 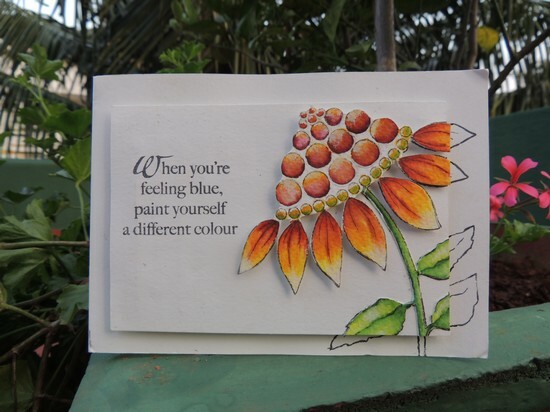 I loved the card you received too - something as simple as receiving a handmade card can mean so much. Oooh Thank you so much Shylaa!! Thank you so much Karthika! You are truly blessed with generous, caring, and giving friends, and I can't think of a nicer way to say thank-you than with a beautifully written tribute like the one you've shared here today! Crafters truly are caring folks and we're all blessed to be in this great community together! So sorry you have been struggling lately .... huge hugs and love to you!!! I love all the happy mail!!! I don't care what people say, the crafting community is the BEST!!!!!!!! You are blessed with a so many international and local friends. Sorry about your challenges and truly are wonderful. You are an amazing woman and pray that your 2018 will be full of sunshine in your soul. Hugs always!!! Thank you so much Nancy...I am hoping 2018 will be cool too!! Thank you so much Nana....I have already started using the goodies....dont want to hoard it like I usually do ! Ι am so glad that you like your goodies, Sonia. Enjoy them, my dear friend. I will smile everytime I see that you use them in your beautiful crafts. Thank you so much for your kind words. And thank you to participating in my birthday candy. Kisses and hugs from Greece, my sweet lady. My goodness! 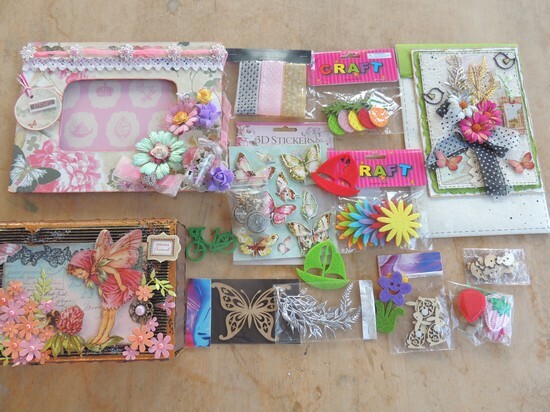 Your craft room will be a very happy place with all of those goodies! Hehe yes Chriss...I tend to hoard my crafting gifts but determined this time to really put each item to good use. What amazing treasures you have received! I am sorry to hear that you had a rough year, but I am happy to know that your crafty friends have brought you happiness through kind words and beautiful crafting supplies!! WOW! Such wonderful goodies from amamzing crafty friends!! Pooja card is beautiful. Made me smile too! OMG how did I miss this post ! Thank you soo much for the mention and so kind of you to write all that <3 appreciate it and im humbled !